I am tempering my excitement. This has the potential to be absolutely amazing or a destructive travesty of one of modern fantasy’s epic works. In an exclusive over at Deadline, Universal has announced that they’ve acquired the rights to Stephen King’s The Dark Tower and will be turning the seven volume epic fantasy into a trilogy of films and a tie-in television series that will fill in the blanks between the movies. Ron Howard and writer Akiva Goldsman (A Beautiful Mind), along with producer Brian Grazer, picked up the rights as soon as they were available, having previously been sold to JJ Abrams. 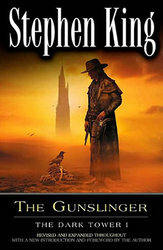 In case you aren’t familiar with the novels, they concern Roland Deschain, the last in a line of knight-like gunslingers, wandering the world(s) in search of the mythical Dark Tower, convinced that finding it in some way will heal his world. For more, you can check out the official site of the books, here. The approach we’re taking also stands on its own, but it’s driven by the material. I love both, and like what’s going on in TV. With this story, if you dedicated to one medium or another, there’s the horrible risk of cheating material. The scope and scale call for a big screen budget. But if you committed only to films, you’d deny the audience the intimacy and nuance of some of these characters and a lot of cool twists and turns that make for jaw-dropping, compelling television. We’ve put some real time and deep thought into this, and a lot of conversations and analysis from a business standpoint, to get people to believe in this and take this leap with us. I hope audiences respond to it in a way that compels us to keep going after the first year or two of work. It’s fresh territory for me, as a filmmaker. Howard will direct both the first film and the first season of the television series that will tie the movies together. So whoever they have playing the lead role of Roland Deschain, as well as all the secondary actors, will be required to commit to a lengthy shoot. There is as of yet no word on any casting, but Howard wants to get things off the ground as soon as he can.